The Churchmouse Shoulder Cozy is one pattern that we cannot stop knitting around the studio. Not only is this one of our go-to patterns but our customers love it too! 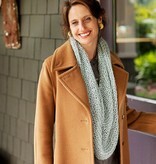 Easily knit in an evening making it a must have pattern for last minute gifts. Wear it as a cowl with your coat or over your shoulders as a caplet for just enough warmth. Pattern instructions written for two sizes using worsted weight held double with a lovely silk mohair blend. 229 (393) yds worsted-weight yarn. 229 (393) yds lace-weight mohair yarn. Gauge: 9 sts = 4"